The Hen returned from our journey to the heartland with an unexpected souvenir: a loose tooth. He’d wondered off and on throughout Kindergarten when he would finally lose a tooth and, on August 7th [since I might need to remember this] he finally joined ‘the club’. He’d bitten into a plum and then complained that it had hurt his tooth. I remembered about the loose tooth and, upon inspecting his mouth, found it was rather loose. I attempted to pull it out, but failed on the first try. I assumed, as was the case with the Gort, that he’d want to wait a while. But the Hen, if there’s one word that describes him, it’s motivated. Motivated to keep up with his nine year old brother. Motivated to meet the tooth fairy. He insisted I pull out the little crooked white cap and, after giving it another firm tug, I found it detached rather easily. I expected tears, exclamations of pain, but all I got was…..excitement? It was probably the second time in my parenting life that I’d expected a seriously averse reaction and got a neutral or positive one instead. The first one was, also with the Hen, when he had to get something like four vaccinations at once and the nurse practically staple-gunned two needles in one arm and two in the other and instead of irate screaming, all I got was…..stunned silence. ‘When did I lose my first tooth?’ the Gort naturally wanted to know And, despite being somewhat diligent in recording every ‘first’ my first-born ever had, I found I drew a complete blank. Six? Seven? Kindergarten? Grade one? None of the above? Maybe I’d written it down somewhere, I silently crossed my fingers. ‘I’m not sure,’ I replied, hoping he wouldn’t ask again. That night the professor sat at the table with his middle son and helped him write a letter to the tooth fairy. ‘1’ being a ‘tooth’, I guessed. The letter made me smile, because it so clearly underscored his motive for this whole tooth-losing business. He wanted money. The Hen went to sleep on the top bunk in the room he shares with the Gort. He made sure that his note and tooth were wedged under his pillow and then he vowed to fall asleep right away so the tooth fairy would come. When they were all finally asleep, the professor reminded me ‘don’t forget we have to do the tooth fairy tonight.’ Because we forgot not once, but twice, with the Gort, and the Hen would be devastated if he woke up in the morning with a note and tooth still under his pillow. As happens every time a tooth is lost, I racked my brain to remember how much the Johnson Tooth Fairy pays for donated teeth. One dollar? Two? A loonie? A toonie? A quarter? I found the journal I [very occasionally] keep for the Gort and flipped through the few pages that document the last three years of his life. There was no mention of him losing a tooth. I would have to wing it. I pulled out my plastic bowl of spare change. It was filled with nickels, dimes and quarters and one lone loonie. No toonie. I deposited the one dollar coin under the Hen’s pillow and carefully retrieved the tooth and note. Even though Percy had demanded he be allowed to keep the tooth ‘for my collection’. Minutes later, a few of the dormant synapses in my brain fired back to life. I have a blog, it occurred to me. Perhaps I’d blogged about the Gort losing his first tooth. I plopped down in front of the computer, typed in ‘tooth fairy’ and two seconds later, I struck gold. Proverbially speaking of course. There, on my screen, were the answers I’d been looking for. He was six years and three months – nearly four months older than the Hen – when he lost his first tooth. 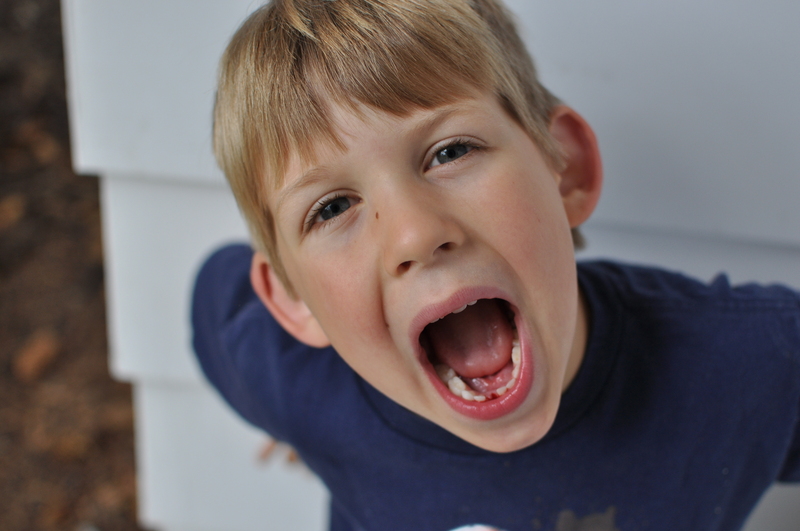 The tooth fairy gave him….a toonie. That’s two dollars. Three years and two months ago.